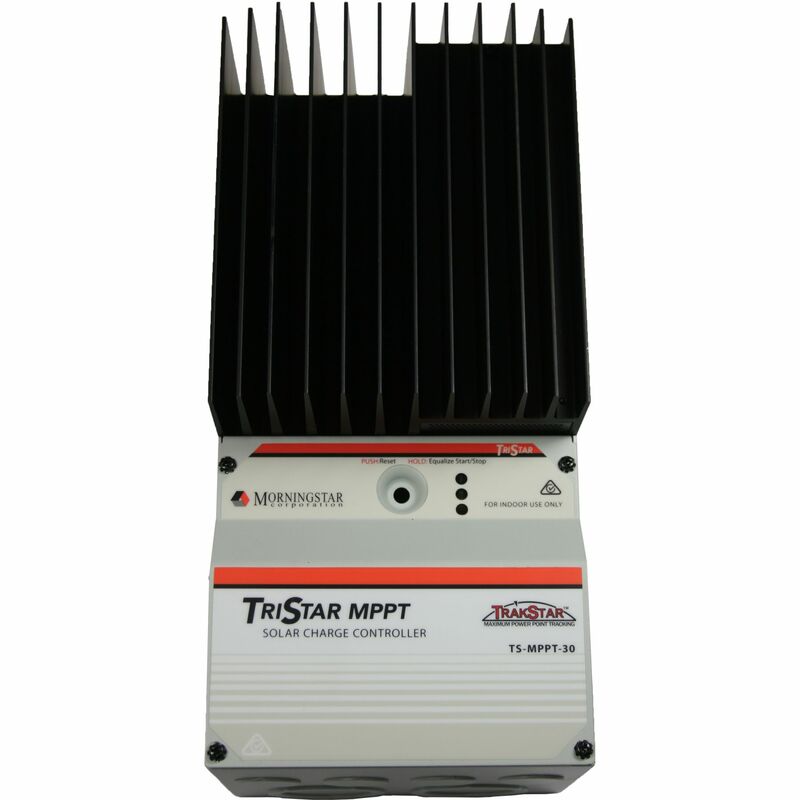 The Morningstar TriStar TS-MPPT-30 can charge a 12v, 24v, or 48v battery pack with flooded, AGM, or gel batteries. The TriStar MPPT 150V utilizes Morningstar’s TrakStar™ Maximum Power Point Tracking (MPPT) technology to extract maximum power from the solar array. TrakStar™ MPPT technology has the ability to charge batteries with solar arrays of higher nominal voltages*. For example, a 12 volt battery bank may be charged with a 12, 24, 36, or 48 volt nominal off-grid solar array. 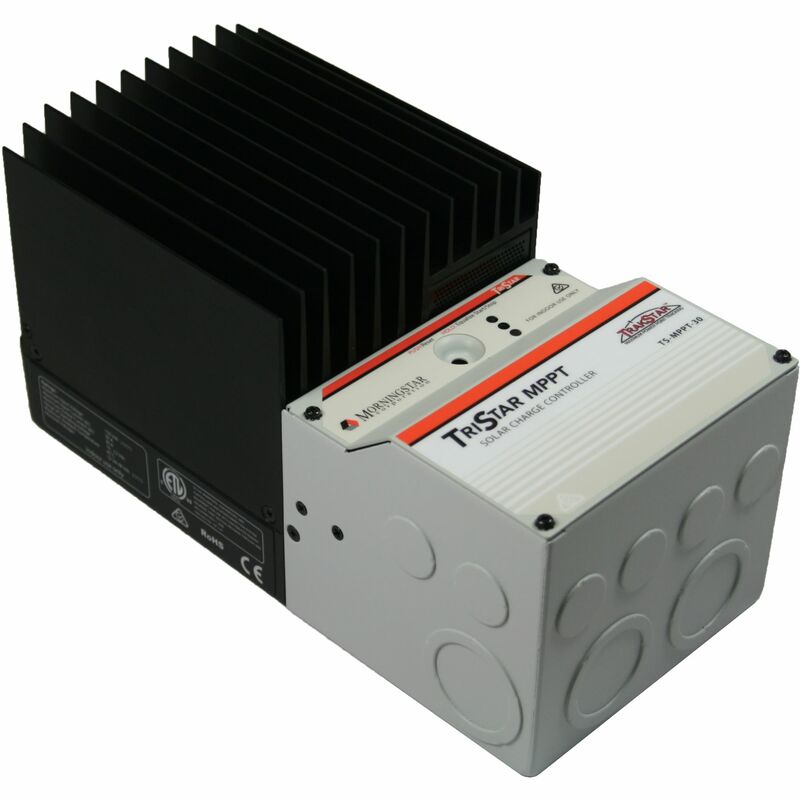 Morningstar’s TriStar TS-MPPT-30 solar controller with TrakStar Technology™ is an advanced maximum power point tracking (MPPT) battery charger for off-grid photovoltaic (PV) systems up to 3kW. The controller provides the industry’s highest peak efficiency of 99% and significantly less power loss compared to other MPPT controllers. The TriStar MPPT features a smart tracking algorithm that maximizes the energy harvest from the PV by rapidly finding the solar array peak power point with extremely fast sweeping of the entire I-V curve. This product is the first PV controller to include on-board Ethernet for a fully web-enabled interface and includes up to 200 days of data logging (*Ethernet Cable not included, and some features require optional accessories sold separately). Robust thermal design and no cooling fans. Continuous operation at full power to 45°C without need to de-rate. Meterbus: communications between compatible Morningstar products. *The nominal off-grid solar array's voltage must be equal to or greater than the voltage of the battery pack you are intending to charge. Do you own the TS-MPPT-30? Please, tell us what you think about it. It helps us provide you with better products. Please note that it may take up to 72 hours for your review to appear.